Toronto, CANADA, 27 September 2018 – Surbana Jurong and Autodesk Asia today signed a Memorandum of Understanding (MOU) to jointly promote advanced technology adoption, sustainable design excellence and digital skills development to bolster Surbana Jurong’s competitive differentiation and technological leadership. IDD is a key thrust under Singapore’s Construction Industry Transformation Map (ITM). Enabled by BIM, IDD fully integrates processes and stakeholders along the value chain through advanced info-communications technology and smart technologies. “As a technologically driven leader in urban and infrastructure consulting, Surbana Jurong is committed to driving digital transformation across the built industry’s value chain. This is why we value working with technology leaders like Autodesk who are as dedicated to innovating with their toolsets as we are on our projects,” said Wong Heang Fine, Group Chief Executive Officer, Surbana Jurong. 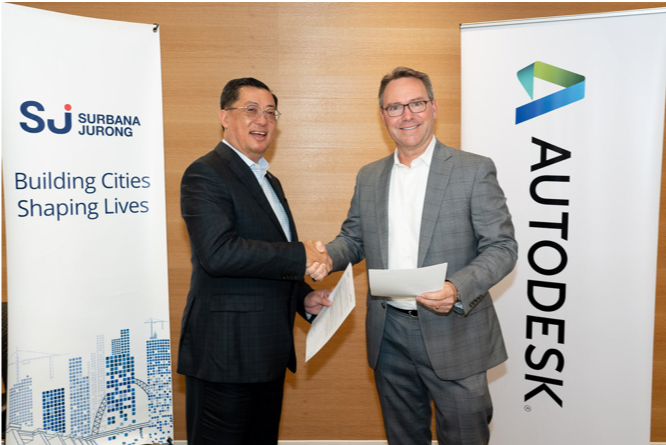 Together, Surbana Jurong and Autodesk will also explore the development of a Centre of Excellence and robust training and development programme built on Autodesk technology to ensure the former and its extensive partner ecosystem are future ready. Surbana Jurong’s motto ‘Building Cities, Shaping Lives’ reflects its belief that development is more than just steel and concrete. Surbana Jurong creates spaces and designs infrastructure where people live, work and play, shaping cities into homes with sustainable jobs, where communities and businesses can flourish. Autodesk and the Autodesk logo are registered trademark of Autodesk, Inc., and/or its subsidiaries and/or affiliates in the USA and/or other countries. All other brand names, product names or trademarks belong to their respective holders. Autodesk reserves the right to alter product and services offerings, and specifications and pricing at any time without notice, and is not responsible for typographical or graphical errors that may appear in this document.